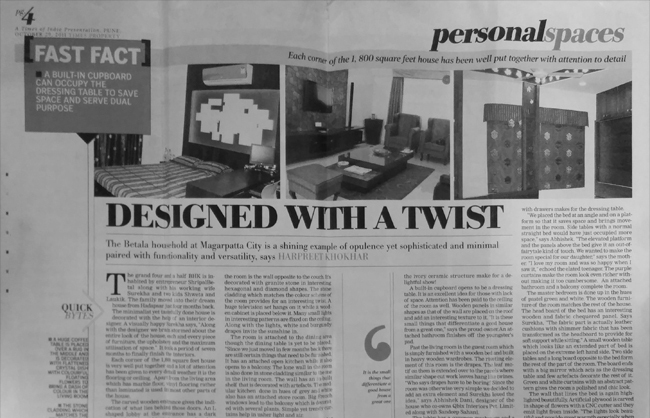 Abhishek Dani Design was covered in Times of India News Paper for creating dynamic interiors for our most respectful client Mr. Hitesh Bhatt in Bungalow is located in Wadgaon Sheri, Pune. 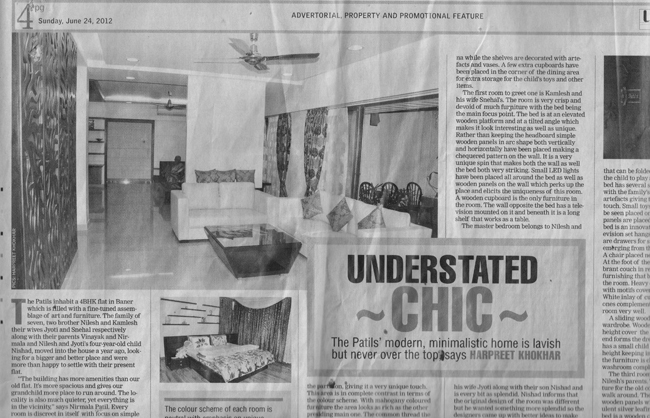 We did interiors for Mr. Manav Ghuwalewale and the pent house was located in Wakad, Pune and our creative and professional designs were published in Fevicol - Design Idea. For our project work we were highlighted in Times of India news. 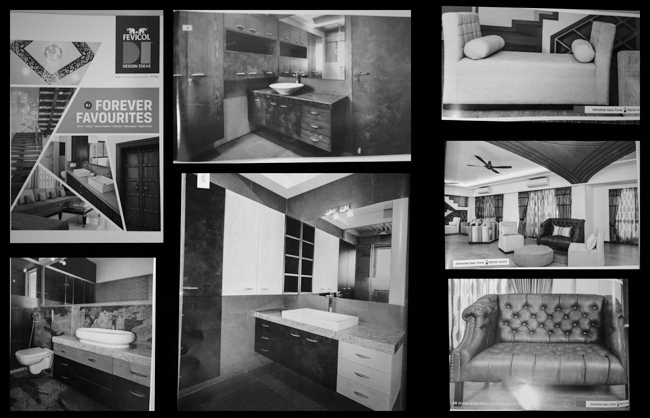 We worked for Mr. Nilesh Patil's residence which is located in Aundh, Pune. We created the same what Mr. Nilesh and his family looking for. Our creative idea was liked by Times of India too. We worked for commercial project - Viva Fit Gym located in Salisbury park Pune. 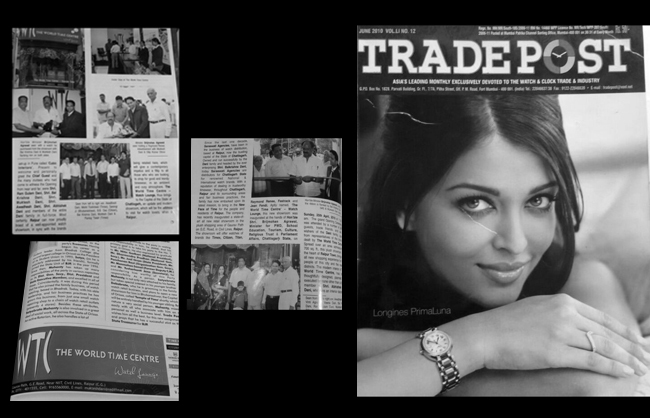 Our client Mrs. Kavita Baldota wanted to setup a gym with all the things perfectly placed and look professionally, Our team created all the things so professionally that our designs were placed in Commercial Design Magazine. Abhishek Dani Design worked for World Time Center, an exclusive watch showroom located in Raipur, Chhattisgarh. 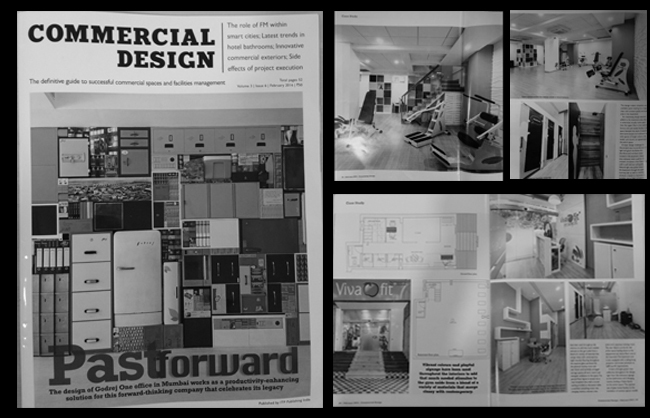 Our client Mr. Muktesh provided only the roadmap for interior of showroom, we executed this project within timframe and our design was published on Trade Post Magazine. Residential Interior Project - The Betala House Our client Mr. Shripal Betala located at Magarpatta City is shining example of Opulence yet sophisticated & minimal paired with functionality & versatility. 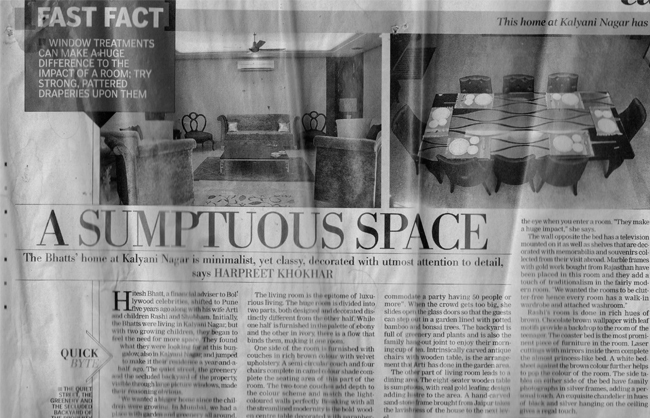 A grand four & half BHK interior designed by us was in news.